NO ONE likes the guy who brings a guitar to the party. I hope he dies a horrible fiery death while I sit here listening to Fiona Apple sing “Frosty The Snowman” and sipping an appletini. hahaha, luckily I think this might be a dieing breed. Dying is spelled like that. A platypus on fire sounds horrifically adorable. ….. That’s not grammar, that’s spelling. I remember those guys from high school. They carried around guitars they couldn’t play to impress people. I can’t tell you how many times I’ve been at a party and some guy showed up with a guitar and treated the event as his own personal performance venue. Most recently I was at a friend’s birthday party back in March. Guitar guy had been silently biding his time all night, like a cobra waiting to strike. Finally, when it was time for the cake and the whole crowd of guests had attentively gathered in one spot, guitar guy announced that he was going to ‘accompany’ everyone while we sang happy birthday. The candles were barely blown out when guitar guy transitioned into “time of your life’ by Green Day. He played AND sang the song four times in a row. As he was also a bit drunk, by round number three he was also crying a bit. So were most of the guests. True story. How does facepunching not sound like a great idea to everyone at that party? I have to say, while it may be dieing, it’s certainly not extinct yet. I went to a small gather at a friend’s house. Less than ten people there total. And there was a guy with a guitar playing, oddly enough. Green Day’s ‘Time of Your Life’. I find the coincidence absolutely freakish. omg! either it’s their official secret anthem or just really easy to play. either way, I’m just glad scott is calling attention to this social atrocity before it’s too late. 1. LAYOR IS A DOUCHE! 4. How is Scout gonna get through this one? 6. Artwork is getting better and better!! LOVE LOVE LOVE THIS COMIC!! Pizzlies go NOM NOM NOM!!! genetically abnormal, AND emotionally bloodthirsty! I hope that doesn’t catch on. I hate when everyone copies me. I have no idea what you’re talking about? Of course there’s nothing wrong with replying? If I wanted to be any more relaxed I’d be naked and have a beer? P.S. Could this be arranged? I’m not easy on the eyes, so I would need to be clothed to relax and have a beer, plus I thin kI have like 8 chest hairs… very unsightly. Hahaha, it’s cool, I’ll bring a razor and we’ll call it a good old time. OH! I get it now. This has happened to me before. That was a joke before. About people copying me? You know the one? I don’t actually go ROOAROHH when I don’t like music. It’s okay if that catches on. And it honestly doesn’t bother me when people copy me. =D We’re all good! I wish this was my grandfather. So then, the cracking look equals annoying scene related powers. Just one more reason to despise cracks, right next to my mothers back of coarse. Very scene-related powers, and a very well said comment. Thanks! I’m really happy you like the comic, and I have a passionate hate for “guitar guy” as well, one used to frequent a coffee shop I’d go to… every damn day he’d be there. I’m loving this super doucher mind controller thing you have going on. haha, that’s a very good analogy, I’ll have to remember that. I think every time I might catch a stray tune of it, my eye brow goes up in annoyance… my eyebrow does that apparently. In response to the question about the phenomenon about “Time of Your Life”, I remember having only to strum four open chords in repetition, so that might be why most guitar guys play that song. I might be mistaken, though. Also, most Green Day songs are really easy to play on the guitar (up there with most Beatles songs), consisting of mostly power chords, or barre chords played like power chords. Not many solos, either. I didn’t even like Nirvana. 2) It’s really damn easy to play and sing at the same time. Same two rules go for “Wonderwall” by Oasis. I’m pretty sure both of these are mandatory. The only parties that my guitar are at are the ones held at my apartment. That said, it only gets pulled out if someone asks me to play. Even then, I refuse to stick to the mindless and easy. I’d rather break out the classics or perhaps string together some blues riffs… and often end up passing off the guitar before long anyway cause a lot of my friends also play. This is the proper way to guitar-up the party. Make it so it’s not about one guy trying to sleep with your girlfriend and more about letting everyone have a little more fun. ahh there have only been 2 updates since I’ve been gone, the suspense is killing me! Also I do believe Green Day songs in general are universally known by all guitar guys. I think it’s a rule to become a part of their guitar guy gang. 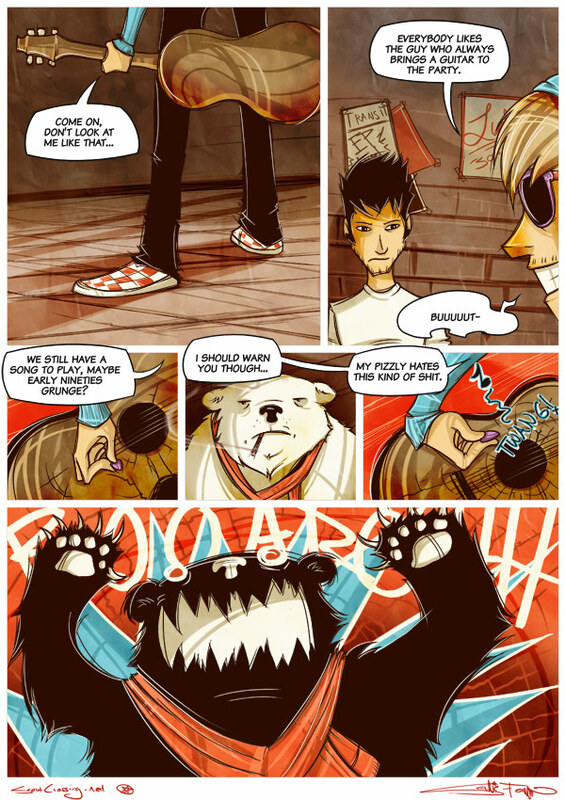 I randomly stumbled upon your comic today, and I must say, I just love the coloring here! The print a few pages back is my favorite. I’m excited to see where this goes! Wow ok, these other comments are from two years ago, but anyway, this is great! Lovely, brilliant. I really like it.